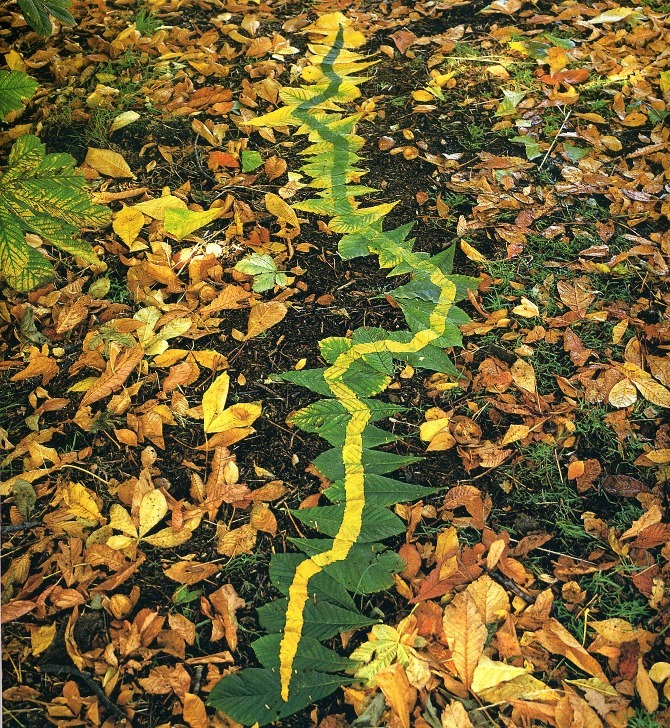 Look at the work of Andy Goldsworthy and reflect on how he uses his own body and movements, and the way he emphasises his own involvement in balance with the natural materials he uses. 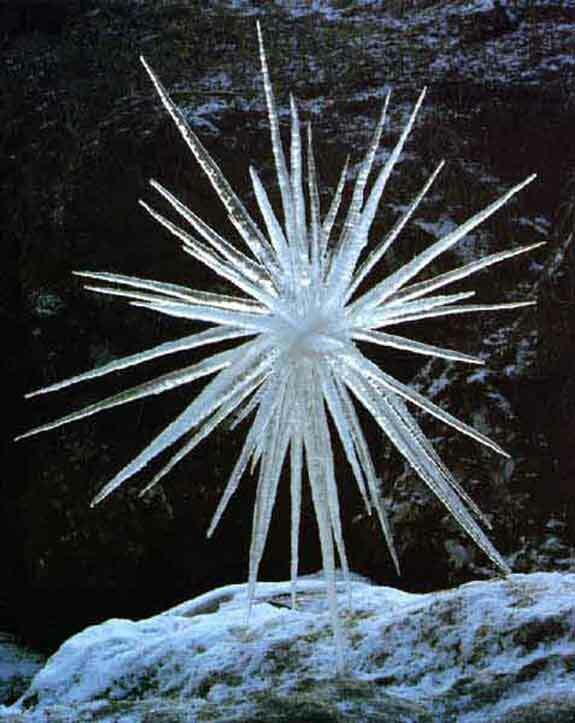 He usually uses geometry, precision and craft skills for his part but rarely adds anything man-made or brought to the site – like fixings or colour – to the end product, which is purely formed from the site. 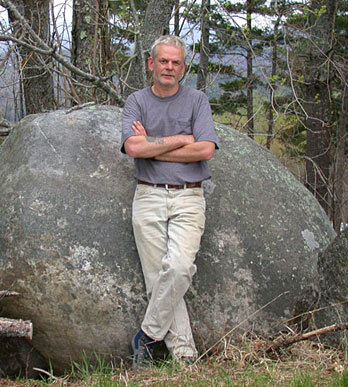 Andy Goldsworthy (born 1956) is a British sculptor, photographer and environmentalist producing site-specific sculpture and land art situated in natural and urban settings. England born he now lives and works in Scotland. 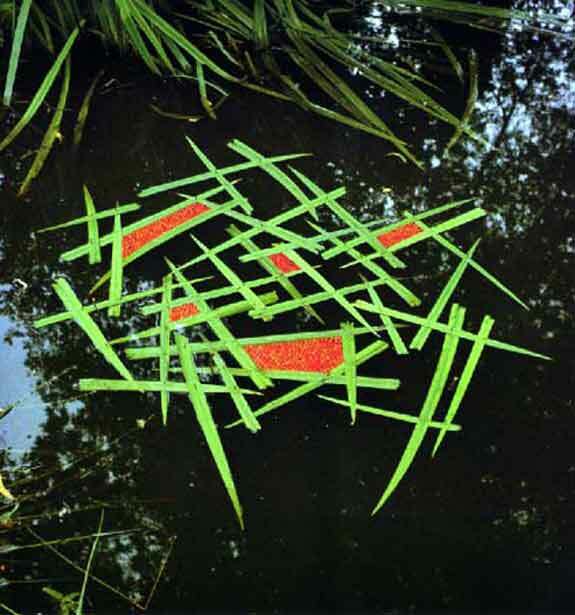 He mainly creates ephemeral, and transient works using found natural materials including reeds, thorns. 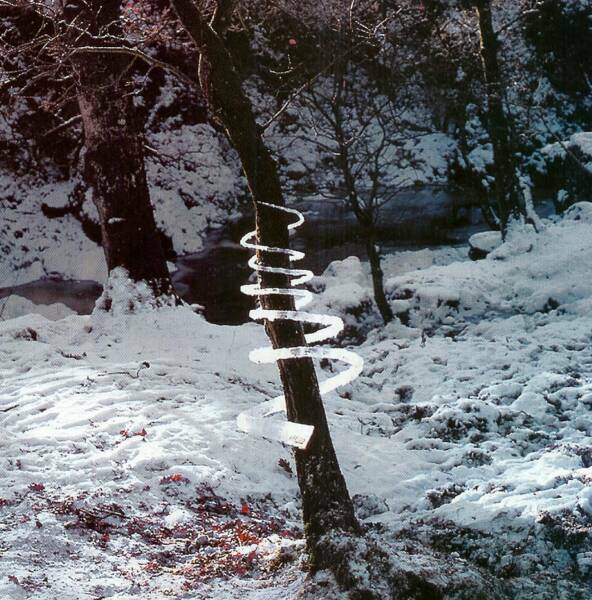 stones, leaves, twigs and snow and ice. 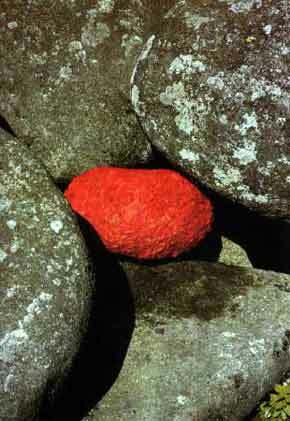 Sometimes he shapes these before using though often the objects are used with no brought to site colour etc. 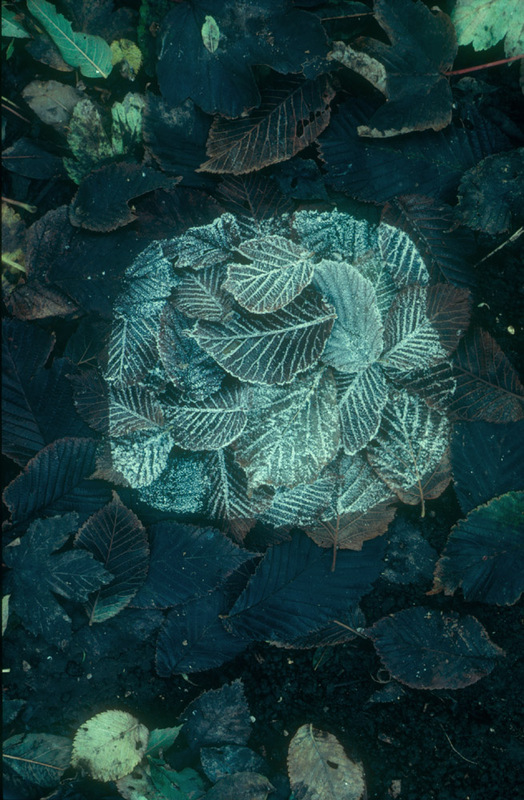 Due to the short lived and transient nature of the work he photographs it in place immediately. 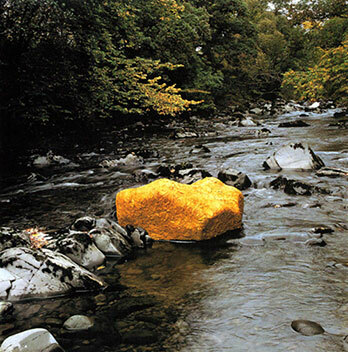 Several times in the statements by Goldsworthy above he mentions the transience aspect of his works. 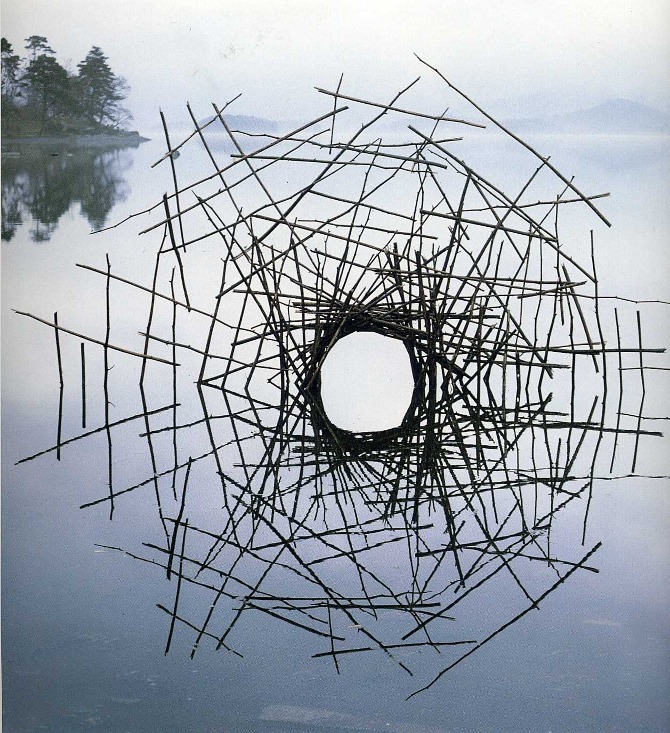 Using natural untreated found objects he works in a manner sensitive to the objects and what he is depicting. 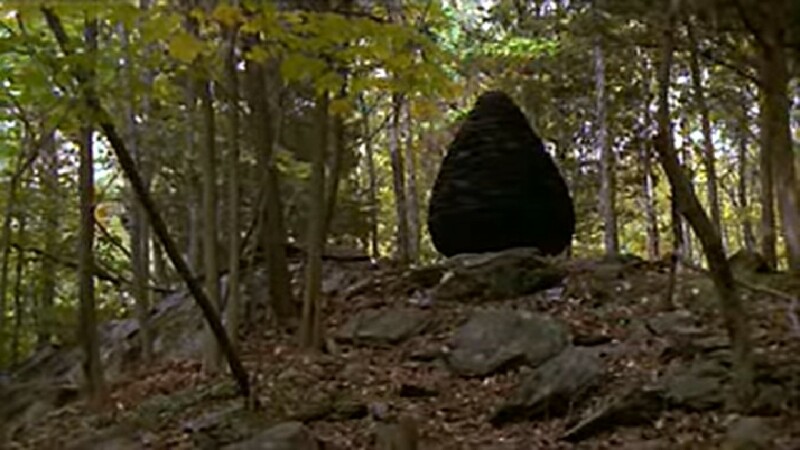 The objects he uses are produced by nature as part of her on-going progression of the seasons, transiting from spring to summer to autumn, life to bloom to decay. His works also echo this process. It is this sympathetic empathy for nature that imbues much of the power in the work. Additionally, some of its strength of purpose comes from the fact that few will ever see the work. 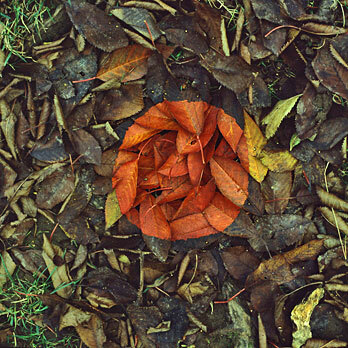 The arranged leaves in graduating colours and tones may be gone on the next breath of wind. I’m sure he must endure some frustrating times losing work half finished due to the vagaries of nature. 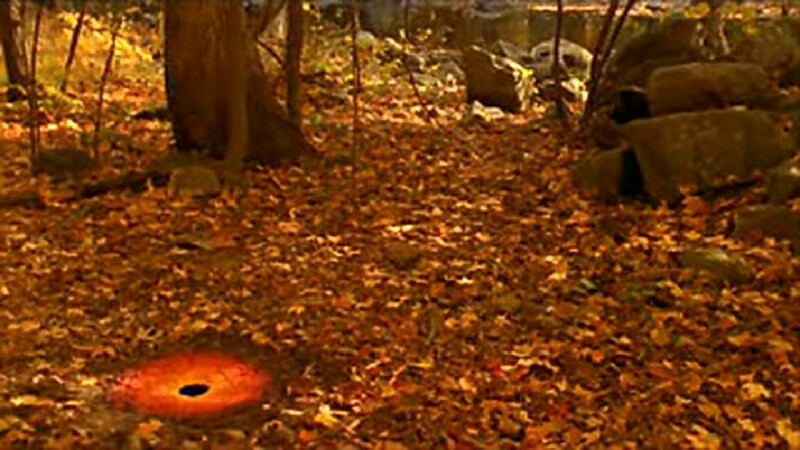 Many of his pieces depict a hole. 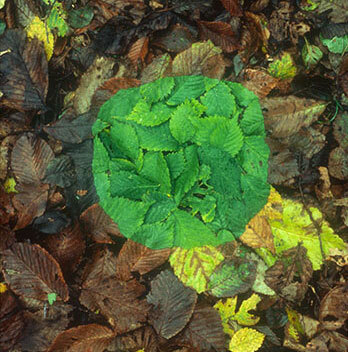 In a sense this shows that we are only looking at the surface and not seeing the whole of the object and subject. 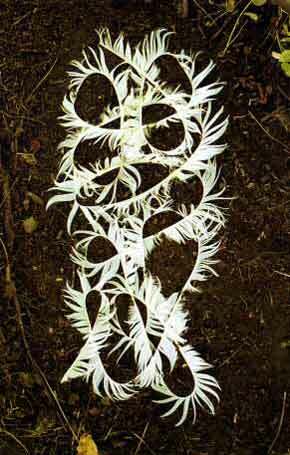 In a way this is like nature, much of what occurs passes us by as we never take the time to look see and appreciate the small delicate art of nature such as a rainbow, spider web of veins in a leaf. 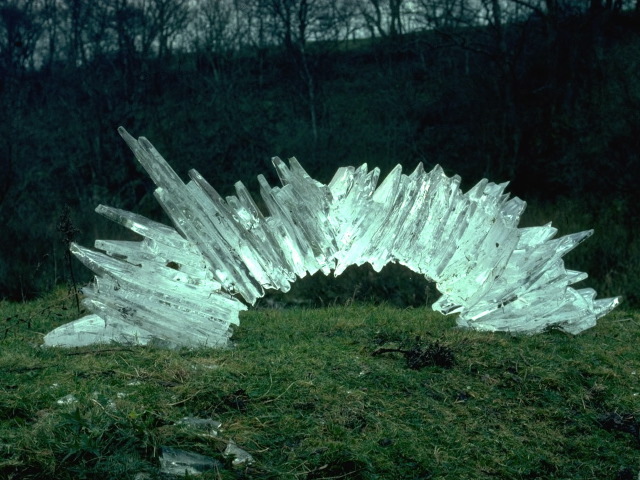 Goldsworthy, freezes some of this in his work, in some senses artificially creating what nature has already but doing it to ensure that we do take that second longer look. 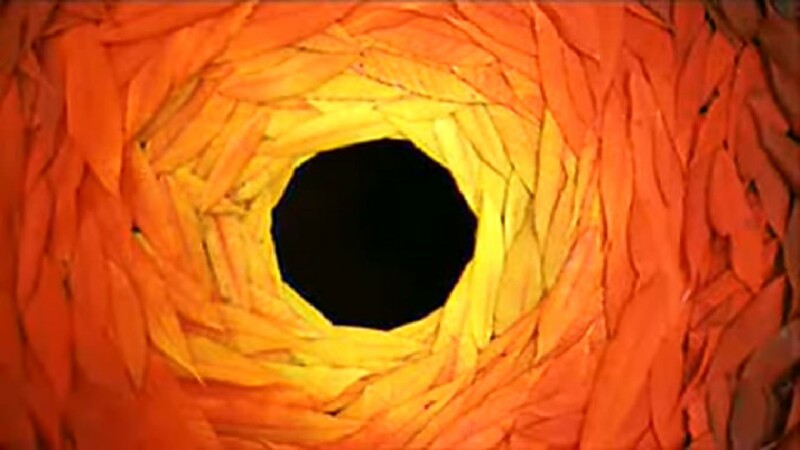 “The underlying tension of a lot of my art is to try and look through the surface appearance of things. 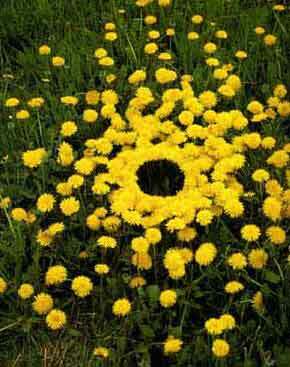 Inevitably, one way of getting beneath the surface is to introduce a hole, a window into what lies below.” : (Morning-earth.org. 2018). 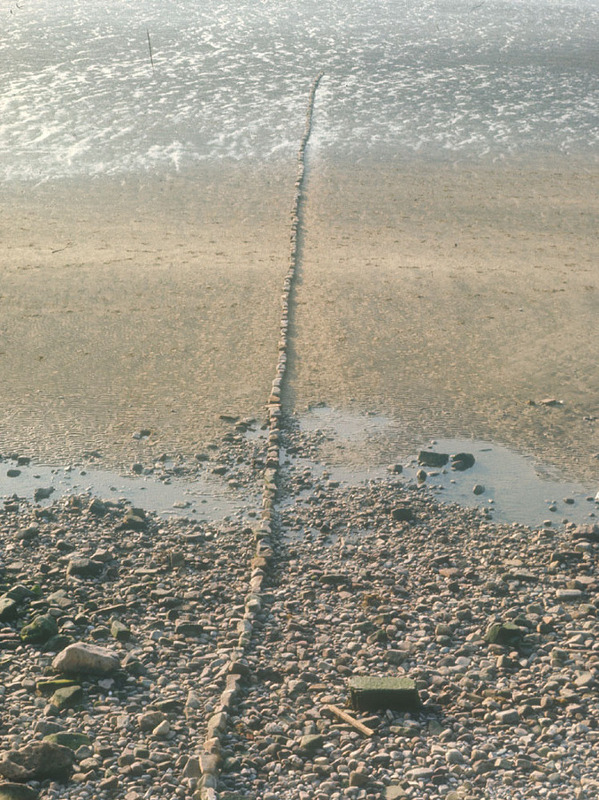 Balancing how long the viewer will look at work to how long it will last, the tide will come and cover his work when next exposed it will be different again and again with every changing tide. The work takes on a life of its own separate from the artist created. 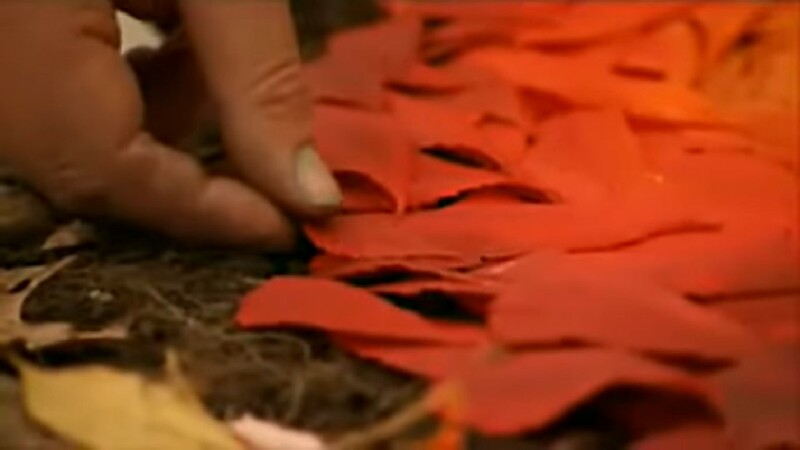 The leaves will dry, perish and rot and the cut leaves will wilt within a couple of hours and even after just a single afternoon the art will have changed substantially from that directed by the artist. The wind will disturb the carefully laid leaves and tumbled to new positions slowly disintegrating the piece fragment by fragment. 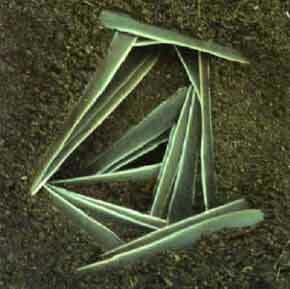 Careful placement of the objects within Goldsworthy’s works is integral to how they work and are perceived by viewers. Each piece is carefully posed and then positioned to create a ‘pixel’ in the jigsaw of his work. 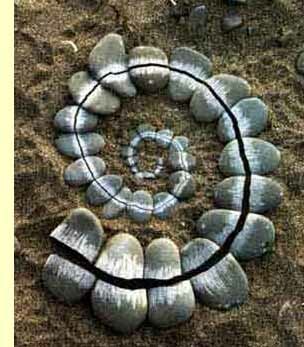 Many similar elements careful positioned create a sense of balance within the piece and a harmony with its surroundings. 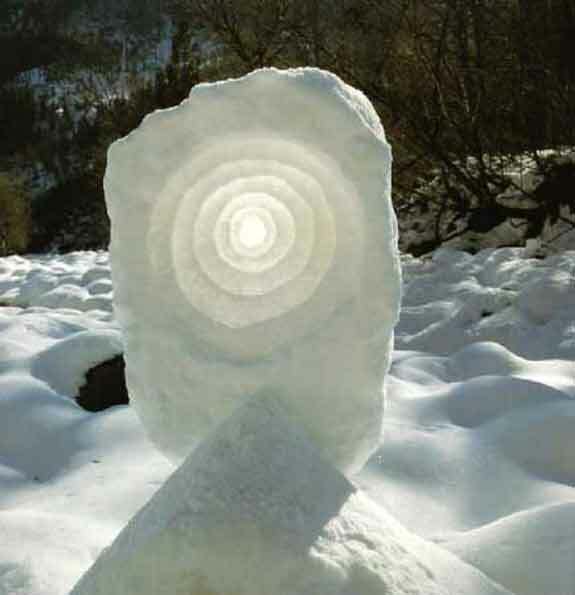 However, sometimes there is a sense of tension in the work, this occurs due to the transient nature of the work. 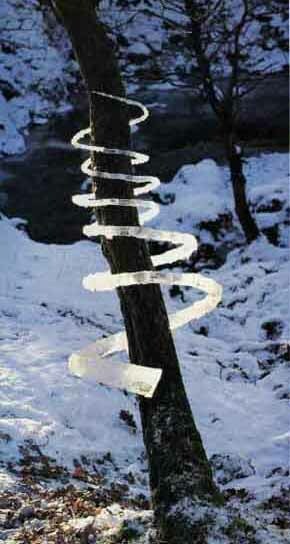 Shaped ice spirals carefully positioned and ready to tumble as soon as the first thaw occurs, leaves ready to scatter away at the first hint of a breeze. Other works have a solidity that will not he disturbed by the elements. 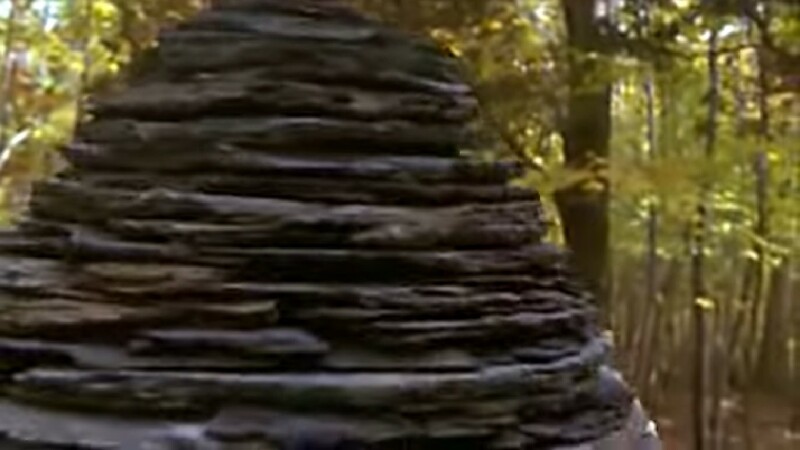 A slate pine cone shaped like and a as solid as the 5th century Irish monastic beehive dwellings. 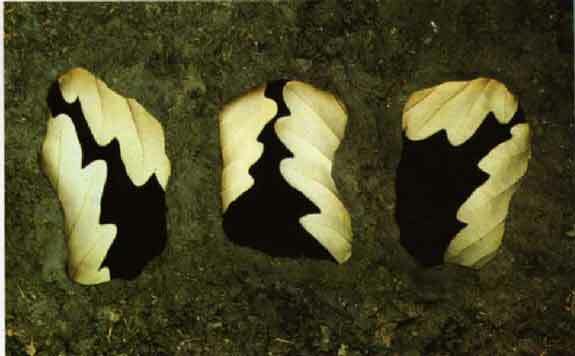 Examples of Goldsworthy transient works. Each piece shown here will in a very short time not exist anymore, the tide will obscure the line of stones, the warmth of the day will melt the ice and snow and the wind will scatter the leaves. 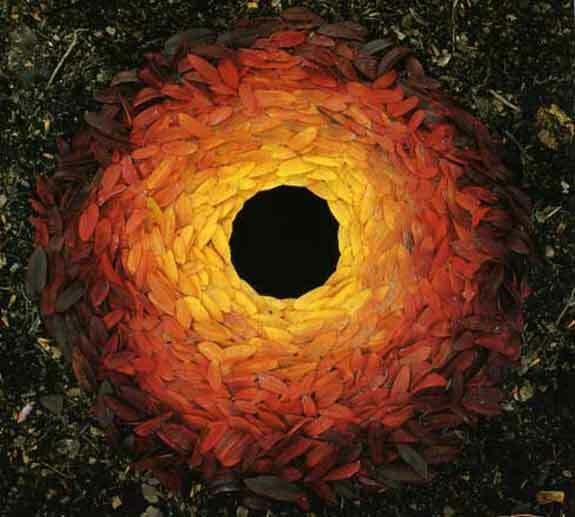 But, Goldsworthy has made us look again at nature forcing us to see what is often overlooked.